She began preparing the site itself the day before by gathering from the wedding’s mountain setting many natural materials – pine cones, rocks, acorns, and branches. Early the next morning, she went to the ceremony site where she spent hours chanting, playing the flute, and carefully building our mandala, a beautiful composition of rose petals, leaves, stones, seeds, spices, and acorns. She arranged flowers, pine cones and branches at the bases of nearby trees, gracing the whole area with reverent, natural beauty.When the time arrived, we stepped into a space that she had made sacred through her energy, voice, music, and presence. The container she had created allowed the ceremony to unfold in effortless grace. We felt at once grounded and joyful throughout. Through our collaboration with Suzanne and supported by her spiritual attunement, our ceremony emerged as an authentic, meaningful celebration of our union. We carry in our hearts symbols from the ceremony that reflect our highest aspirations and intentions. They remind us to place into living practice, through our actions, the sacred vows we spoke to each other, and our commitments to our highest ideals of love and truth. 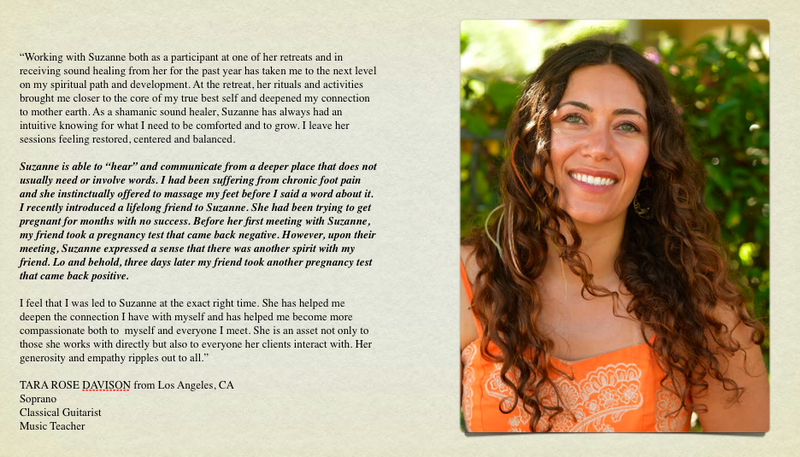 “My week-long dream quest retreat with Suzanne was too wonderful for words. It was one of the best experiences and best decisions of my life. 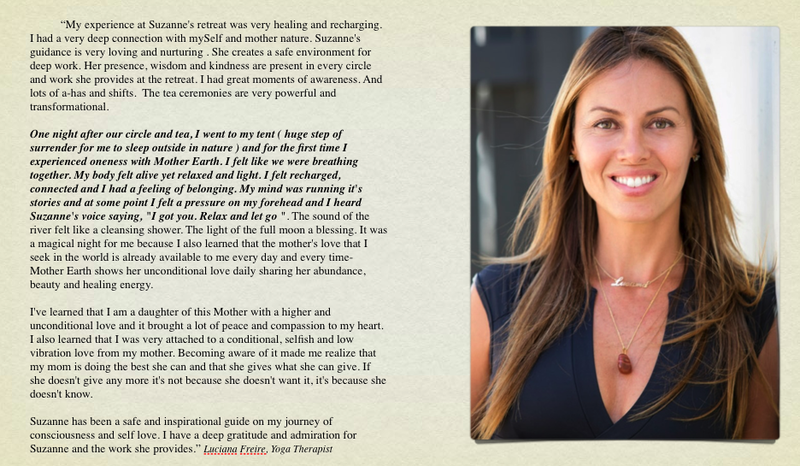 I am so grateful to myself for making the choice and so grateful to Suzanne for her endless generosity, love, guidance, insight, healing, and teaching. Most of all, I’m grateful for her being who she is; her depth of presence and example made a lasting impression that guides me daily. My journey to and from the dream quest retreat had obstacles and unexpected turns; I was coming from a tumultuous period, seeking clarity. Suzanne supported me every step of the way spiritually, emotionally, and also concretely by giving me an alternative retreat option when I missed my flight to the first one! I felt held and accepted every step of the way even though I was scared of this unknown thing called a Dream Quest! I have not felt so completely taken care of and loved since I was a small child. 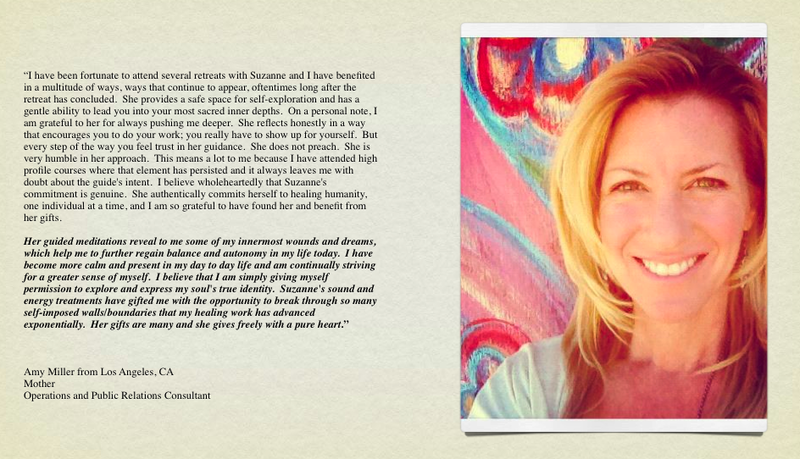 Suzanne’s depth of love was overwhelming at times and other times there was exceptional light-heartedness and ease. Before, during, and after the retreat, I was guided in a variety of practices in such a gentle, compassionate, and fully attentive way, taking me much deeper into myself than I have gone before. The result: not only did my intention for clarity come, but much greater clearing, healing, integration, and empowerment came than I had hoped for! On my journey home, I felt a lightness, a strength, a knowing, and an ease that was new to me. I felt confidence and radiance in situations that had riddled me with anxiety. I felt ready for life with a “bring it on” zest. In the months since the retreat, in simple ways, I have integrated the empowering tools that Suzanne introduced to me on the retreat into my daily life. I have spread my wings in new ways. I have settled. I have grown in my understanding of myself and of life.